You don’t have to make gluten free bread. You don’t even have to buy it. But, with so many people allergic to wheat, why wouldn’t you!? Breads made out of rice, tapioca, or lentil flour taste better and often have the same texture as breads made out of wheat flour. And, in these beautiful wine regions, many have started to dry the grape skins, mill that into flour, and make delicious baked goods out of Chardonnay, Riesling, Merlot and Cabernet flour that are also rich in antioxidants. Think of the profit margin when making products like this out of the byproducts from winemaking using ingredients that you can get for free. Most winemakers are happy to give these grape skins away. Bricks not only makes their own gluten free bread, they make it taste delicious. We had to ask the waiter because we were certain he made a mistake and gave us the regular bread. It is really as tasty as it looks here. 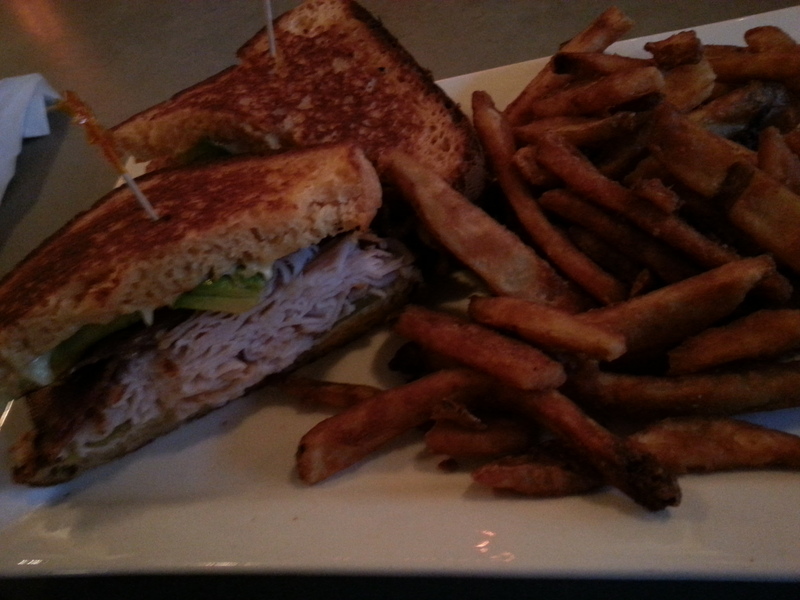 This Santa Fe sandwich came with turkey, bacon, avocado, green chili, and pepper jack and came with fries as crispy as these look. This entry was posted on Wednesday, October 30th, 2013 at 5:54 PM	and posted in El Dorado, Food. You can follow any responses to this entry through the RSS 2.0 feed.